Nineteen species of stony coral were examined using a variety of techniques. In all cases, GFP was found in varying amounts. It should be noted here that GFP is also found in Ricordea, Palythoa, Zoanthus and the anemones Condylactis gigantea and Phymanthus crucifer. However, GFP levels were found not to vary much with depth. In fact, there was no correlation at all between depth and GFP levels. Measurements of reflectance and of the excitation spectrum for chlorophyll fluorescence in GFP-containing corals over a wide range of depths and GFP fluorescence indicated no evidence of GFP photon absorption either to enhance or reduce photosynthetic activity. If GFP plays a role in photosynthesis by either adding or taking away protons, then one would expect to see a correlation with depth as one does with other protective compounds such mycrosporine-like amino acids (MAAs) that protect against ultraviolet light, but there does not appear to beone in the corals they examined ( Montastrea faveolata and M. caernosa ). Compared to other non-photochemical methods that corals have to reduce the effects of excess excitation energy, the authors concluded that the photoprotection afforded by GFP is negligible in Caribbean corals. Another pet theory of aquarists is that ultraviolet light is involved in the production of fluorescent pigments. In the case of GFP at least this is most likely not the role it plays. The authors could find no evidence of an excitation peak in the range of UV (200-400 nanometers), suggesting GFP plays no role in UV protection. The authors, however, are quick to point out that it is still possible that GFP may play a role in helping a coral deal with environmental stresses such as high light, UV or temperature levels by as yet, undiscovered mechanisms. There is preliminary evidence that GFP levels are inversely correlated with superoxide dismutase (SOD) protein levels in corals exposed tolight and temperature levels that produced superoxide radicals (SOD is involved in their reduction). It is tempting to speculate on the possible reasons for this inverse correlation. Corals can be colorful even without fluorescent pigments. As has been stated before (Delbeek and Sprung, The Reef Aquarium vol. 1), corals are predominantly brown because the zooxanthellae they contain are brown due to the fact they absorb most other colors. Other colors can also be found in the host tissues and are the result of non-fluorescent pigments. What many people may not realize is that just because a coral contains fluorescent pigments, they may not be apparent to our eyes. For example a coral that appears brown to our eyes under natural ambient light may glow blue under ultraviolet or blue light. This can be explained by several factors such as the spectral distribution of the ambient light and the strength of the fluorescence. The authors used the same measurement techniques as the previous paper to measure coral reflectance and fluorescence and the modeling of downwelling spectral irradiance to explore the contribution of fluorescence to the spectral signatures ofcorals as a function of variations in depth, solar zenith angle and fluorescence efficiency. In general it could be concluded that fluorescent pigments that absorbed wavelengths that are transmitted well by water, have high fluorescent efficiency, emit fluorescent wavelengths that are only moderately attenuated by water, and emit at wavelengths to which the human eye is most sensitive are able to produce the most striking fluorescent effects for human eyes. This is especially true for p575 and p583 that emit in the orange range of the spectrum, one that is attenuated enough by water to reduce any competing influence from downwelling light and coral reflectance, but not strong enough to reduce the emitted light. These corals absorb heavily in the green range of the spectrum, which is still easily transmitted through water. The greenish pigment p515 is the most widespread in corals but it emits in a region of the spectrum that is not heavily attenuated by seawater so would argue that it would be overwhelmed by ambient light, however, the high efficiency of this pigment andthe sensitivity of the human eye to green combine to give a high level of visible fluorescence. In contrast to these pigments, the blue-green p486 is not readily observed in nature. This is due to several factors. First this portion of the spectrum is readily transmitted by water so the degree of coral reflectance is high. Combined with the low efficiency and % color saturation of p486, the reflectance is great enough to overwhelm the fluorescence emitted by p486 under natural ambient lighting conditions. As a result green and orange emissions are the ones most commonly seen by divers. Finally the mere presence of fluorescent pigments or any color for that matter should not be used as a sign that these pigments have a function. There is certainly a reason for the color, but there may be some other function of the pigment, and the color is merely a neutral by-product. No one knows yet what the functions of these pigments are, they may merely be due to genetic differences. 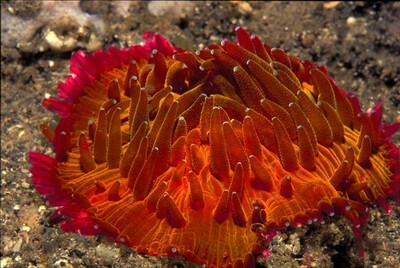 The authors identify several areas where further research may lead to some idea of the functions of coral pigments, in particular the fluorescent ones: ecological studies that examine the relationship between habitat and color morph distribution, controlled studies to determine what factors control the expression of color in corals (probably the area of most interest to aquarists! ), analysis of coral emission spectra and its relationship to vision in fishes, and molecular studies of the fluorescent pigments to determine a relationship between structure and function (this will also help toascertain the elemental composition of these pigments which may provide clues as to what elements might be necessary to replenish in closed systems to help maintain or intensify these colors e.g. manganese for anti- oxidants as has been speculated by Julian Sprung) . The authors feel that once the function of pigments and how their expression is controlled, is understood, coral color may prove to a good indicator of environmental conditions on a reef. For aquarists this paper helps to explain why corals may appear certain colors under certain lamps. Obviously those lamps in the blue end of the spectrum such as actinic 03s provide light of such a narrow spectrum that there is no light in their spectrum for fluorescence in the green, orange and red ranges of the spectrum to compete against and helps to explain why corals under these conditions exhibit the greatest fluorescence intensity. Also high Kelvin metal halide lamps have a larger portion of blue in their spectrum that further enhances the fluorescent effect of some pigments.” It might also be interesting to add a little green to some lamp combinations in order to stimulate those corals that might contain orange fluorescent pigments such as Scolymia and Cynarina. And for me … I finally have my answer … when I saw that day-glow orange coral it was emitting fluorescence in a wavelength that had been greatly reduced by the intervening water above, but when I took the picture with my flash the added colors in the flash overwhelmed the orange fluorescence of the coral … so next time … no flash. One of the problems encountered when attempting to rear ornamental shrimp is high mortality during the early stages of development. In this paper the authors assert that the reason for this high mortality is the belief that larvae do not need feeding until their egg yolk is completely consumed after 24 hours. In experiments with the commercial rearing of the marine ornamental shrimp Lysmata debelius they should that high larval mortality during early stages of larval collection could be reduced if they were fed immediately after hatching and not waiting 24 hours. Their work demonstrated that captive newly hatched L. debelius larvae ingest microalgae within minutes after hatching. When fed solely with Artemia nauplii, they had acceptable survival rates with stocking densities at or below 50 larval per liter; but when nauplii are combined with microalgae, survival was further improved to zoea stage 2 as initial mortality was reduced, and higher stockingdensities were supported (up to 75 larvae per liter). 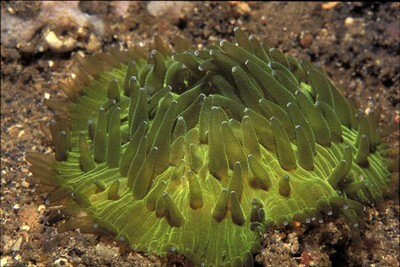 The microalgae used were Rhinomonas reticulata, Skeletonema costata and Tetraselmis chuii. Higher survival through metamorphosis to zoea 2 was always observed for groups fed combinations of microalgae including Tetraselmis chuii. Their recommendation is that larvae should be fed microalgae within 2 to3 hours of hatching.